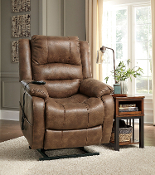 Double your pleasure and your sense of style with the Yandel power lift recliner. Dual motor capability gives you the freedom to recline back and elevate your legs independently for more custom comfort positioning, all with the touch of a button. The power lift feature gently eases you from the ultimate slumber into a lift-and-tilt position to get you back on your feet, effortlessly. Designer upholstery may look like gently battered leather, but it’s actually a feel-good, durable fabric with warm, cozy appeal.